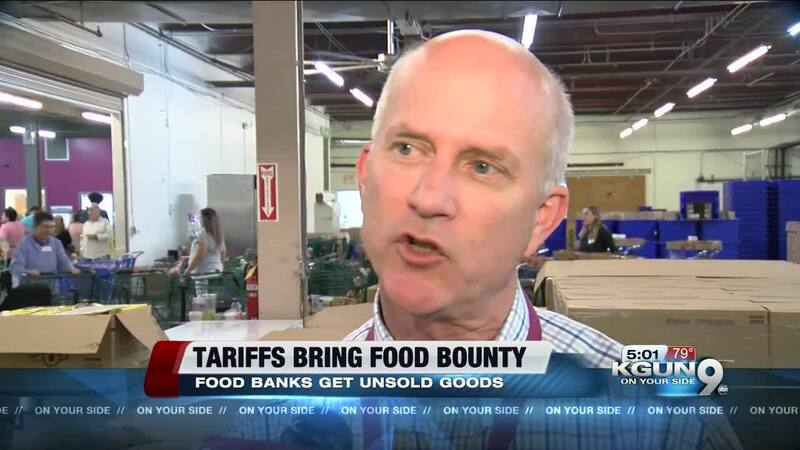 Trade wars and tariffs have brought a surprising benefit to our biggest local food bank----pounds and pounds of food. When countries jacked up their tariffs to retaliate against U.S. tariffs, food that failed to sell in places like China ended up here. It's unusual when the Community Food Bank of Southern Arizona has a lot of chicken to share with hungry low-income clients. But this rare bounty is a byproduct of international trade disputes. When they led to tariffs in booming markets like China those places stopped buying. So the U.S. Agriculture Department bought up the unsold items and sent them to places like the Food Bank. Food Bank CEO Michael McDonald says, “About five or six weeks ago we heard from the federal government through the state of Arizona that probably 5 million pounds of very nutritious food was coming to southern Arizona because of the trade disputes with Canada and China. And we're talking about chicken, pork, all kinds of fresh vegetables and fruit that we don't see apples, blueberries, walnuts". The bonus food items will be available at least through the month of March, and will be distributed as bonus items to people already picking up monthly emergency food in The Federal Emergency Food Assistance Program. Food Bank clients like Jerry Mondragon are looking forward to some extra treats on the menu. "It's okay having vegetables and fruits but it would be better for the people to have chicken, pork and beef once they are able to get it"
Most of the food in the food bank is canned or dry goods that do not need special storage to avoid going bad but this surge of government food is coming in fresh or frozen and that puts a little extra strain on the cold storage facilities. To rent extra cold storage the Food Bank is looking to raise about 600 thousand dollars. That money would also go to rent more refrigerated trucks and hire more drivers to move this temporary bounty across the five counties the Food Bank serves. Employees at the food bank say bonus food items do not replace a holiday food drive or the monetary donations that keep the food bank running. They say if anything, the free items place the Community Food Bank in a position of needing more support to fund an increase in staff and equipment. The Food Bank also needs more volunteers to help with the surge of food and the people who will benefit. You can learn more about volunteering at this link .